Call for private clampers to be banned | What Car? 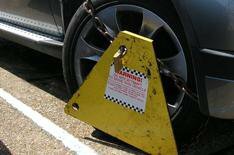 Car clamping on private land should be banned, says the AA. The AA says clamping should be outlawed in England and Wales, as it is already illegal in Scotland, because up to one in 10 drivers have been clamped or fined by private enforcers with no redress to an independent arbitration process. Frightening methods of punishment, which border on 'criminality', are also being meted out to drivers who have been clamped, according to the AA. The Government is currently looking at a range of proposals to regulate the industry, including forcing all clamping businesses to register with a trade association. The AA, however, says that the industry's trade association, the British Parking Association (BPA), does not have the powers to regulate car clampers. Patrick Troy, chief executive of the BPA said the AA hasn't come up with a credible plan to address the issues. He said: 'The BPA has established a code of practice for wheel clampers. This, we believe, is a good first step to improving standards, but we would like to see the Government regulate the sector further so that motorists are better protected.